Bowdon coach Todd Eubanks captured his 400th career coaching victory with a 15-1 victory over Liberty County on April 4. His career includes stops at Peach County, Southeast Whitfield, Heard County, Landmark Christian and Cass before coaching at Bowdon for the past six seasons. The Red Devils are 17-6 on the season and Eubanks holds a career mark of 401-223. PEACHTREE RIDGE SETS MARK: When Peachtree Ridge defeated Cherokee 4-3 on April 7, it gave the Lions a 20-4 record on the season and set school record for most single-season victories in school history. Colquitt County and Lowndes split a doubleheader on April 6 and both teams remain tied atop the Region 1 standings. However, Lowndes owns the tie-breaker due to run differential. Colquitt took the first game of the doubleheader 3-1 behind pitcher Dylan Collins who allowed just an unearned run on four hits in the complete-game victory. Dylan Dalton went 1-for-2 with two RBIs to lead the offense. 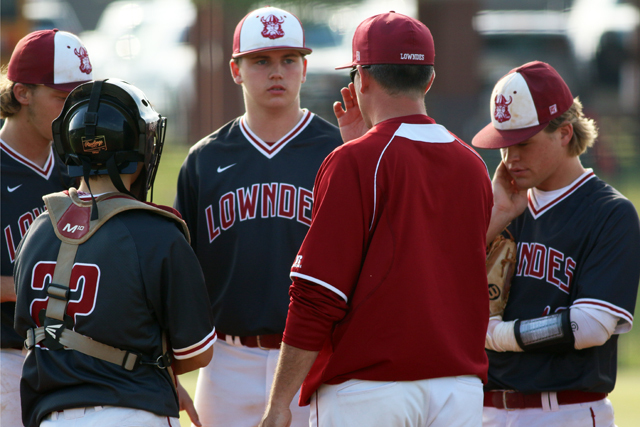 But Lowndes took a 10-6 victory in the second game of the doubleheader behind C.J. Rose’s 3-for-4 performance. He finished with a solo homer and three RBIs. Parkview earned a trio of victories on its spring break trip to Florida. The Panthers defeated Venice, Sarasota and Tampa Jesuit. In the three games, Robert Bennett went 4-for-7 at the plate with two doubles and six RBIs. Michael Bryant went 4-for-10 with a double and an RBI, while Logan Cerny finished 4-for-12 at the plate with two triples and two RBIs. Cerny also pitched one-third of an inning to earn a save on the mound. Bennett, Braden Hayes and Miles Garret also earned pitching victories. Bennett allowed just four hits and struck out nine in a seven-inning outing, while Hayes allowed just two runs in 6 2/3 innings. Garret allowed two runs and fanned three in a five-inning victory. Walton defeated Hillgrove 8-4 on April 6 when Bobby Spencer broke a 4-all tie with a grand slam in the sixth inning. Spencer finished 2-for-4 with five RBIs, while Luke Boynton went 3-for-4 at the plate to lead Walton. Allatoona has won 16 in a row and is in first-place in the Region 6 standings. But the Buccaneers face a stiff challenge with a pair of games this week against River Ridge. The region rivals meet on April 10 at River Ridge, then at Allatoona on April 12. Both games are scheduled for 5:55 p.m.
Effingham County took two of three from Glynn Academy and took the lead in the Region 2 standings. The Rebels took a 4-0 victory on April 2 behind pitcher Ethan Johnson’s two-hit shutout. Zach Wilson’s 3-for-3 performance ignited Effingham at the plate. Then Effingham rallied to stun Glynn 4-3 on April 4 by scoring two runs in the bottom of the seventh inning on Jordan Rahn’s single. Rahn finished 3-for-4 with an RBI. Jerid Stokes, Zach Wilson and Cullen Wake collected two hits each in the victory. Glynn Academy took the final game of the three-game set 12-3 on April 6 behind pitcher Will Bowdoin and Hunter Hall’s 2-for-4, three-RBI performance at the plate. Lee County remains in first place in Region1 after taking two of three from Houston County. Pitchers Gavin Paul, Zach Parrish and Brian Myler shut down Houston’s bats in a 13-3 victory on April 3. Jonathan Logsdon, Spencer Hanson, Layne Wiard and Hill Corley collected two hits each in the victory. But Houston took a 9-2 victory in the first game of a doubleheader on April 6 behind pitcher Cameron Jones, who allowed two unearned runs on four hits in 6 2/3 innings. Jacob Profit led the offense, going 3-for-3 with two RBIs, while Chandler Dawson went 2-for-3 with a double and three RBIs. Then Logsdon’s RBI single in the top of the 10th inning broke a 3-all tie and helped Lee take a 4-3 win in the second game of the doubleheader. The loss spoiled solid performances from Profit and Corbet Luna who finished with two hits each. They may be in separate classifications but it’s still a big game anytime neighborhood rivals Pope and Walton meet. The two schools are separated by less than three miles. The Greyhounds defeated Walton 12-8 on April 6. Caden Smith went 3-for-3 with a homer and five RBIs as Pope has won 13 straight. River Ridge went undefeated and took top honors in the prestigious IMG Academy Classic. The Knights defeated Brighton (Utah), Ridgewood (Ill.), Roberson (N.C.) and Canterbury (Fla.). Valdosta took two of three games from Coffee this week in Region 1 play. The Wildcats were led by a number of standouts including Colby Thomas, who went 5-for-8 in a doubleheader on April 6. He finished with a double, three homers and six RBIs. Avery Stephens went 2-for-3 with a homer and an RBI on April 2, then went 5-for-7 with a double, two homers and four RBIs in a doubleheader on April 6. He also earned a victory on the mound in the first game of the doubleheader. Jude Ard earned the pitching victory in the second game of the doubleheader on April 6, hurling a complete game. He also went 4-for-10 during the three games with a double and four RBIs. Eric Posas went 3-for-4 with a double and two RBIs in the first game of a doubleheader on April 6. Trevor Green went 2-for-3 with a double on April 2, then went 2-for-3 with a double and two RBIs in the first game of the doubleheader on April 6. Cory McCann went 2-for-4 with an RBI and two stolen bases in the second game of the doubleheader on April 6, while Kody Noviello had a three-run homer in the first game of the doubleheader on April 6. Derek Wylie went 3-for-4 with a homer and four RBIs to lead Veterans to a 9-7 nonregion win over Jones County on April 3. Cameron Conglose scored the game-winning run in the bottom of the eighth inning on April 6 and helped Oconee County avoid a three-game sweep against Jefferson with a 10-9 victory. Keanu Legaspi reached on an error which allowed Conglose to score. Jefferson took the first two games of the three-game set and continues to lead the Region 8 standings. West Laurens opened up a three-game lead in the Region 2 standings with a three-game sweep of Mary Persons. Crisp County earned four key wins, taking a trio of Region 1-3A victories over Monroe (Albany) and one from Northside-Warner Robins. Center fielder Billy Jones went 5-for-10 at the plate, scored eight runs and stole four bases. Designated hitter Colin Infante went 5-for-9 with two doubles and nine RBIs, while freshman catcher Jackson Napier went 6-for-12 with two doubles, five RBIs and scored five runs. On the mound, freshman Noah Walters and senior Hudson Coleman combined on a five-inning no-hitter against Monroe and combined for 10 strikeouts. Junior Jordan Grinnell earned two victories, allowing two earned runs and seven hits in 6 2/3 innings. Luke Cash went 4-for-5 on offense with two doubles and four RBIs, while Landan Malone went 2-for-4 with a homer and four RBIs to help Haralson County upend Bremen 8-5 on April 6 in a key Region 6 game. Malone earned the complete-game victory on the mound, while Noah Ray also collected two hits. Islands took a 6-3 victory over Calvary Day on April 7. The Sharks scored five runs in the last inning. Lucas Crecy, Mikey Largis, Josh Caldwell, Kole Newman, Collin Young, Bryce Hinson and Tyler Foune all had hits for the Sharks who finished with 10 in the game. Newman, a Georgia College signee, went six innings on the mound giving up one earned and striking out eight. Foune got the save striking out two in the final frame. Defending state champion North Hall has won 15 in a row and will meet Greater Atlanta Christian in a key Region 7 series this week. The Trojans took three games from East Hall last week and clinched a spot in the postseason. Pike County handed Jackson its first two losses of the season and took over first place in the Region 4 standings. The Pirates took a 9-0 victory on April 3 behind pitcher Noah Windhorst’s one-hit shutout. He also went 2-for-3 at the plate to lead the offense. Then Pike took an 11-3 win on April 6. John Austin Sutton went 2-for-4 with four RBIs to lead the offense. Hunter Marion, Jake Maddox and Windhorst finished with two hits each. Ringgold took a 13-1 victory over Adairsville on April 2 as pitcher Nathan Camp, Andrew Ghormley and Casey Pate combined to allow just a run on seven hits. Ty Jones went 3-for-4 with a homer and four RBIs to lead the offense. Camp also added a two-run homer. Ringgold also defeated Lakeview-Fort Oglethorpe 15-8 on April 5. The Tigers’ game with Calhoun was rained out on April 6 and will be played on April 9. Benedictine scored two big Region 2 wins over Vidalia to take over first in the region standings. The Cadets took an 8-2 victory on April 3 behind pitcher Walker Barlow and Ryan Pickard who went 2-for-4 with four RBIs. Barlow allowed one run on two hits in six innings. Johnny Richardson and Garrison Gunby finished with two hits each. Then Gunby allowed just one run on four hits to help Benedictine to a 6-1 victory on April 6. Gunby and John Thorpe finished with two hits each. Dade County snapped Rockmart’s 11-game winning streak on April 6 with an 8-1 victory in Region 7 play. It was Rockmart’s first region loss. Dade County pitcher Greg Templeton allowed one run on three hits to earn the complete-game win. He struck out 13. Noah Bone went 3-for-4 with four RBIs, while Templeton and Jordan Heath collected two hits each. Heard County, despite a 1-8 start, has won 10 of its past 12 games and will meet Callaway in a three-game set this week for the Region 5-2A crown. The Braves are 8-1 in region play. Heard has been led at the plate by Bryan Jones, Tanner Collins and Caden Raines. The trio are batting better than .370. Oglethorpe County’s Ben Beasley has a five-game hitting streak for the Patriots. During the streak, he is 10-for-18 (.556 avg.). He also helped pitch Oglethorpe to a victory over Washington-Wilkes on March 29, going six innings and allowing just an unearned run on four hits. In a 2-1 victory over Social Circle on April 3, he earned the victory, hurling a complete game and allowed just an unearned run on three hits. He struck nine and also went 2-for-4 at the plate. Trenton Berryhill’s three-run homer helped Lanier County top Charlton County 8-7 on April 2 in a key Region 2 game. Hawkinsville pitcher Jacob Cody hurled a complete-game four-hit shutout to help the Red Devils upend Taylor County 1-0 on April 2. Cody struck out 11. Jay Bentley went 2-for-3 to lead the offense. Manchester’s Brandon Redd went 4-for-4, while Noah Braddy went 3-for-4 with three RBIs to help pitcher Garrett Brown defeat Taylor County 8-2 in a key Region 4 game on April 6. Brown also added an RBI triple. Pelham scored a pair of easy wins over county rival Mitchell County. Catcher Doug Curles went 4-for-6 at the plate in the two games with two RBIs, stole six bases and scored five runs. He is batting .509 on the season. Pitcher Dakota McEntyre struck out eight to earn a five-inning victory. He allowed just a hit and one walk while striking out eight. First Presbyterian Day needed 11 innings to top George Walton 8-7 in a nonregion game on April 2. Gavin Bloodworth’s RBI single broke a 7-all tie in the top of the inning, while pitcher Tyler Mimbs earned the victory in relief. Bloodworth finished 5-for-7 at the plate in the game with a double, a homer and three RBIs. Hudson Mimbs went 3-for-6. Then the Vikings defeated Westfield 10-3 on April 3 as Harrison Aulds and Bloodworth each went 3-for-4 at the plate. Aulds finished with four RBIs, while Bloodworth had two. Mount Paran Christian’s Nick Swanson allowed three runs (two earned) on five hits in a complete game to help the Eagles to a 6-3 victory over Class 4A power Troup in a nonregion victory on April 6. Swanson, Noah Rymut, Jack Alexander and Austin Ross collected two hits apiece to lead the offense. St. Francis defeated Alpharetta 3-1 on April 6. The Knights were led by an impressive performance from starting pitcher Jack Gerber and Zach Nozick in relief. Gerber earned the victory after allowing one run on five hits while striking out six in 4 2/3 innings. Nozick allowed two hits with four strikeouts in 2 1/3 innings. Bret Madren and Griffin Weaver led the Knights at the plate with two hits each. Kyle Bork, Brian Orkin, and Will Clark all had RBIs. Savannah Christian has won 11 straight games and took over the top spot in the Region 3 standings with a pair of wins over Calvary Day and Wheeler County. The Raiders defeated Calvary 5-1 behind pitcher Kyle Hilton’s no-hitter on April 3. Hilton allowed just one walk and an unearned run while striking out six. Mark Carlson went 2-for-2 at the plate with a triple and three RBIs. Stratford Academy has won eight in a row, including a pair of Region 7 victories over Mount de Sales. The Eagles won 17-7 on April 3 behind pitcher Clifton Olmstead who earned the victory. Sam Clark went 3-for-4, while Carson Dorsey went 3-for-5 with a double, a homer and five RBIs, while Trey Giles went 3-for-4 with a double, a homer and two RBIs.Then Stratford took a 3-1 victory on April 6 behind pitcher Sammy Martin’s complete-game victory. Martin allowed one unearned run on two hits, while Giles and John Morgan Manley drove runs in. Manley had a double. Wesleyan earned three big wins last week over Lovett, Mount Vernon Presbyterian and Mount Pisgah Christian. In the 4-3 victory over Lovett on April 2, pitchers Christopher Lee, Holden Wilder and Jalen Fulwood helped hold down the Lions, while Stewart Stamper hit a solo homer and Cameron Binney drove in two runs. In a 4-2 victory over Mount Vernon on April 5, Wilder went 2-for-3 at the plate and earned the save on the mound in a 4-2 victory. Don Daniel’s single drove in a pair of runs. Then in a 3-1 victory over Mount Pisgah on April 6, Lee earned the victory on the mound with Fulwood earning the save. Charlie Taylor smacked a two-run homer, while Daniel finished with two hits.